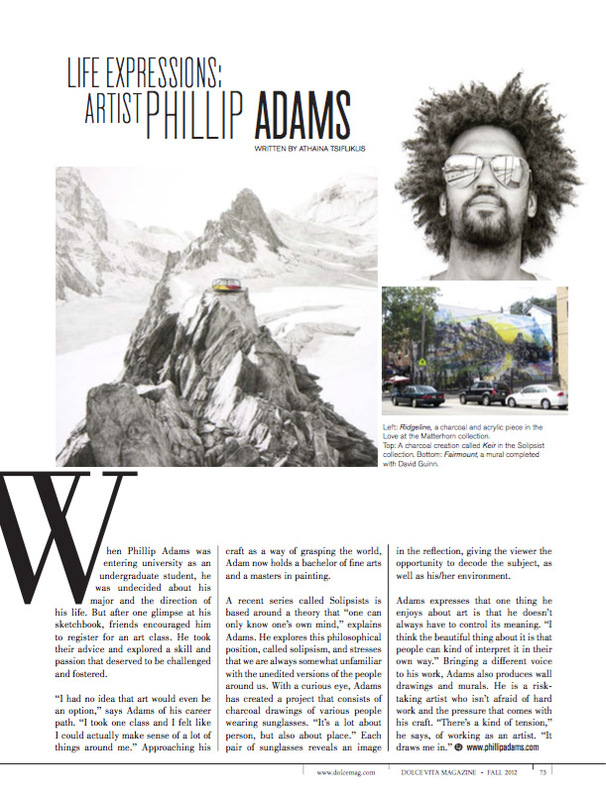 Artist Phillip Adams has been working with Mural Arts for over 10 years – and has had some beautiful artistic adventures across the country. Read on to hear from Phillip about mural-making, community-building, and the art of being a hybrid artist-historian explorer. Carly: How did you start working with Mural Arts? Phillip: I moved here in 2004 to go to the University of Pennsylvania for my Masters Degree, where I took a class with Jane Golden and Don Gensler. I ended up as an assistant that summer with Don, in between semesters, working on a mural on 40th and Brown.In that process, one of the amazing things I started to think about, related to murals and public art in general is how as an artist, the community process takes you outside of yourself. In the studio, it’s you in your own head creating your own problems and asking your own questions, and a lot of what you do as a public artist takes you immediately outside of yourself. You’re interacting, whether it be through themes, ideas, or meanings, and through this public art work, I started to be more aware of the look and feel of my role as an artist as I create public art. Carly: Have you taken that approach elsewhere, like in your work in Montreal? 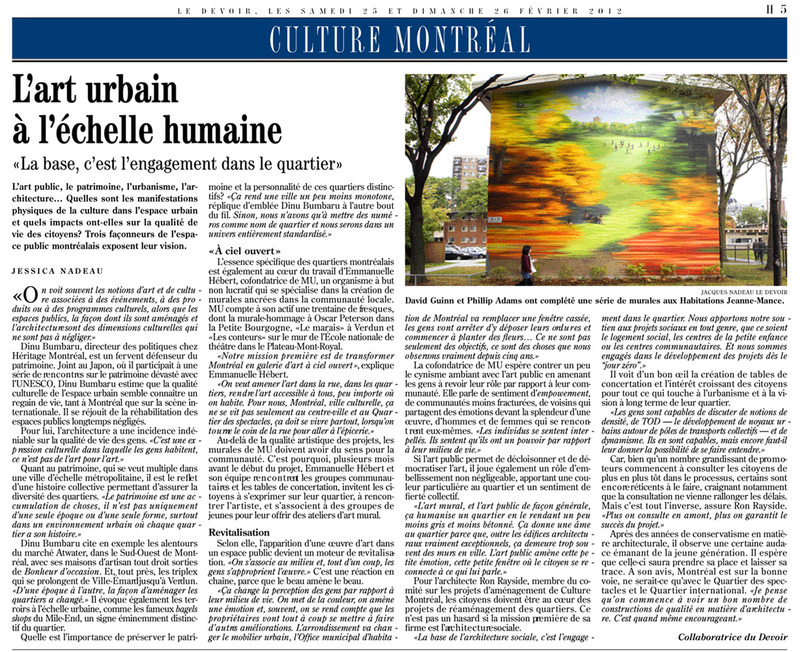 Phillip: The organization that I worked with, MU, in Montreal had seen Mural Arts while they were traveling here for Cirque du Soleil, and they wanted murals at Habitations Jeanne Mance, an affordable housing community at the heart of the Latin Quarter. It’s this huge, amazing community of 17,000 diverse people who are extremely proud of where they are, but they still suffer the stigma of being a community housing project. Talking with the residents, it was immediately clear that as a public artist, you are problem solving – not only to create an immediate impact of beauty and ownership and the idea of place, but also, getting people to register a place as unique when you’re walking by it. 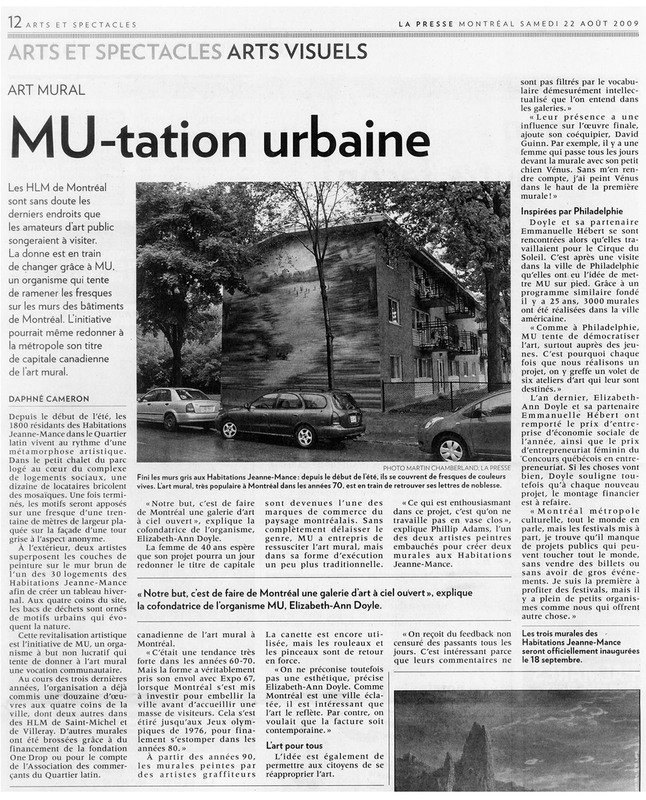 I worked in Montreal for 8 years, and towards the end of that time period, one of the universities in Montreal completed a study of Habitations Jeanne Mance. Previously, keywords for that place were just stereotypes: violence, drugs, gang, that kind of thing. In the newest study though, the keyword for everything was art. They didn’t believe it. They thought they were catching keywords from neighboring areas, like the Quartiere des Spectacles. They reconfigured the search, but again the keywords came back as “art.” They still couldn’t process the level of change in perception. Giving that voice to a hidden community, which was the goal in the beginning, showcased the beauty and amazingness there and changed the perception. In the early 2000s, if a tourist walked through Habitation de Jeanne Mance, they were followed, and now, tourists walk through because they want to see art. Or see the orchard, the community gardens, or the stormwater management that they’ve done. It’s one of the cool things about what we do: you get to see tangibly and socially how once you open a door and give a voice in an artistic way to a group of people, it becomes about the potential and the growth. Carly: It sounds like in Montreal it was about unifying and putting a community on the map that’s hidden. Is that similar to your work in Philly? Phillip: In Philly, there’s been a range of projects that are community-based, but also projects that are issue based. The Industrious Light series is a great example of one of the issue based projects.In the 19th century and through the mid 20th century, Philly was known as the “workshop of the world.” The industries found here defined neighborhoods – like Brewerytown, where there were two main breweries. Neighborhoods completely changed, but the things that we do and the remnants of these buildings are a tangible history of the city. It’s knowing where the roots and the city come from and what they turn into, and when you lose that history, there’s that aspect of great loss. You have all these buildings that are lying vacant, being destroyed, being rehabbed, turned into other things. I started to think about it as these hidden gems that needed a voice of their own.The first in the series was at Ortlieb’s, where the defunct brewery had already been destroyed. An architecture firm salvaged the bottling center right behind it and the building is absolutely phenomenal. With the mural, we showcase what was and also what will be, because that mural is still there and there’s that sliver of Ortlieb’s that is still there but it’s also all new construction in that area.The next in the series is at Rowhouse Spirits. The Philadelphia Brewing Company repurposed the old Weisbrod & Hess Beer Brewery building, but there’s still one massive vacant building attached to the brewery which has some of my mural on it. The building attached is now syndicated to be torn down, but there’s a huge petition to try and save it. These are historical monuments that are completely going away. Neighborhood fabrics are completely changing and losing that voice and history. Carly: In that context, I think it’s so interesting that you’re working on a building at 1241 Carpenter, which used to be a factory, right? Phillip: Exactly, the Carpenter building was originally the Leviathan Main Belting Company. Back when everything ran on steam, they created the huge belts that kept those gears running. You can think of that as the place where it created the potential for all these other industries to function. Later, it transitioned into canvas and tarp manufacturing for covered wagons and sailboats. The owner of the building has transitioned three times, and is now an entrepreneurial type of dude, who, since the 60s, has had artists working in the building with him, slowly but surely carving out areas for artists to work in. Now that entire building is an incubator of small business, entrepreneurs, artists, makers, everything. The owner curated a community that fed his creativity and ideas but also provided a space for artists, knowing that places for artists are running out. He saw this building as a giving tree to them but also them to the arts community. The mural design and idea was through that machinery, to the curtains and drapery, to the fabric, to the tree, more as a symbolism, showcasing these hidden gems of history that have evolved and both of these speak so much for the urban fabric. How much history do you know about the buildings where you live? We can’t let this stuff go away, our curiosity of wondering what these places are. All the information is still floating out there, old maps and everything else we still have access to. Carly: You remind me of a hybrid artist-history urban explorer. Phillip: Right now it feels like that on this project! In a place that loves history as much as Philadelphia (Liberty Bell, birthplace, we got it all!) we take very little value in preserving some of it. In the brewing industry, pre-Prohibition, there were over 700 breweries in Philadelphia that got so big that they started to export regionally–a plethora of breweries, businesses, communities that defined sections of Philadelphia. Prohibition came, and pretty much destroyed all of them. Once Prohibition lifted, some of the breweries got back into the swing of things, but the number shrunk, and then big business came in and started to absorb them. By the late 1980s there were 0.But after that, then what happened? The slow emergence of craft brew. It went from that huge thing, to zero, and now to these little things–a new batch of ingenuity and interest in the old, a new palette, new taste, new idea. It’s this light and creativity that I think is so unique to industrial cities– it’s what can change, and also the realization of potential. It’s amazing how much beauty and weight can be put on something as simple as a symbol. Carly: I can’t wait to see how the Industrious Light series unfolds. Thanks so much, Phillip! I finished the last mural in my series in Montréal on the Elements. It has been an amazing 7 years of going to Montréal and working with the organization MU! I had an incredible time living, working, and getting to know the people at Habitations Jeanne-Mance. Merci pour tout! Finally finished the time-lapse of the mural I did this past spring at Rowhouse Spirits Distillery, commissioned by the City of Philadelphia Mural Arts Program. Nothing like seeing a month of your life condensed into under 3 minutes. Special thanks to the Philadelphia Brewing Co. for letting this happen and to Air is Human for the soundtrack! Won the People’s Choice Award! 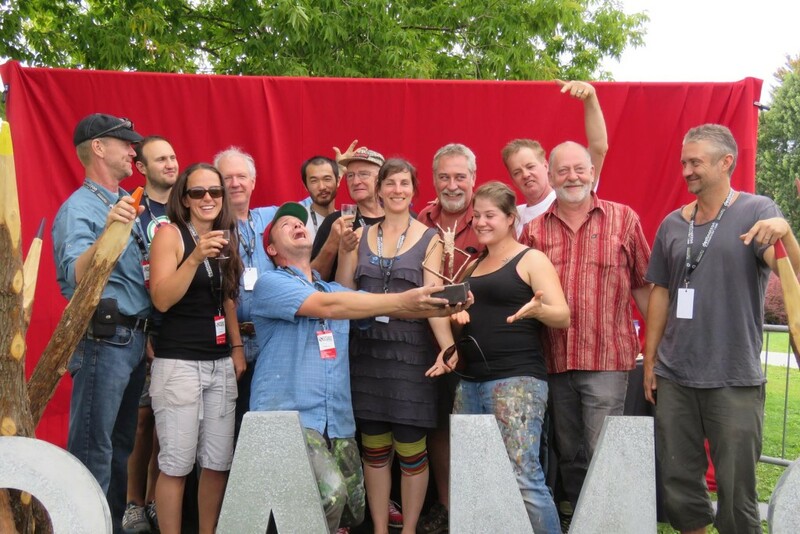 After a great week in Sherbrooke, QC, the Mural Symposium closed with a final announcement of the People’s Choice award. To my surprise, my piece won! Thank you to everybody in Sherbrooke and Lennoxville who came out, to M.U.R.I.R.S for putting together such a great event, and to the other artists for an incredible week. The murals we have in Montreal are pretty amazing and they serve a most noble purpose.To cover up gross, old, nasty brick walls with something pretty. And what’s prettier than nature? That’s why MU created this amazing mural that not only covers up the brick wall but blends seamlessly into the background. 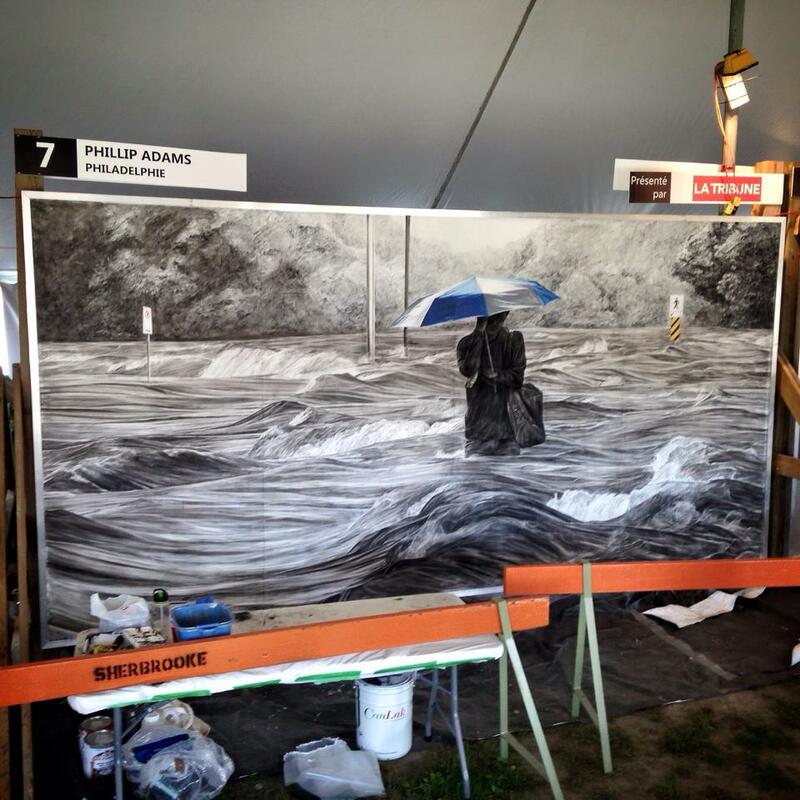 It was painted by American artist Phillip Adams and it’s called Terre d’accueil. Seriously we should be putting these all over the city. 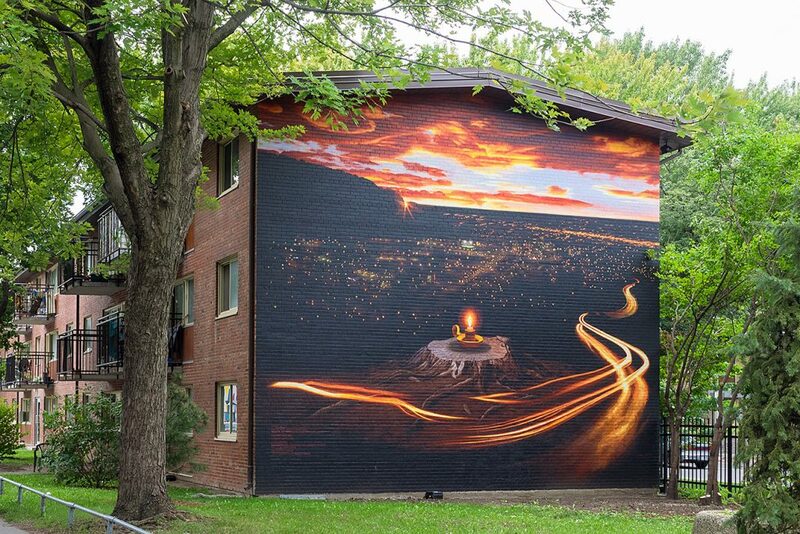 If you’d like to check out the mural for yourself it’s located at the corner of Ontario Est and Saint-Dominique. 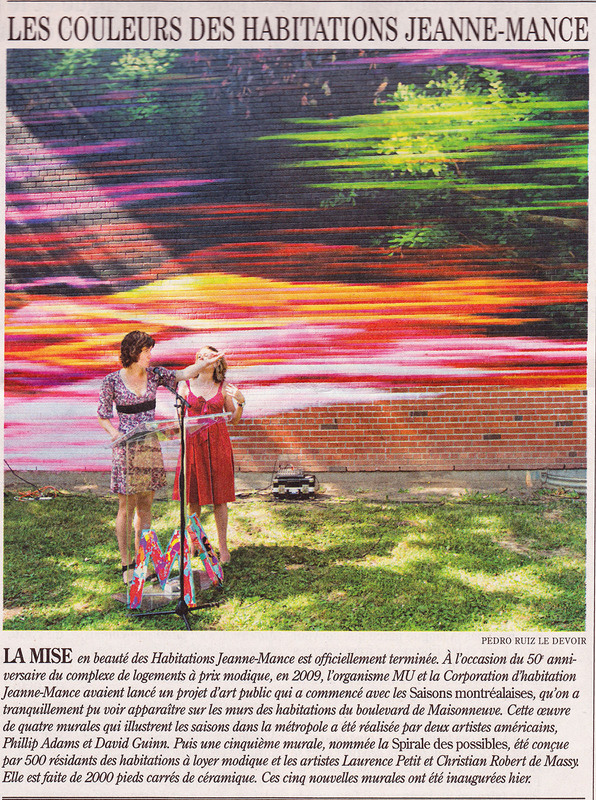 I was invited with nine other artists to participate in Sherbrooke’s 2nd Annual Mural Symposium. Thanks M.U.R.I.R.S! Click HERE to learn about the symposium and to check out the other participating artists. 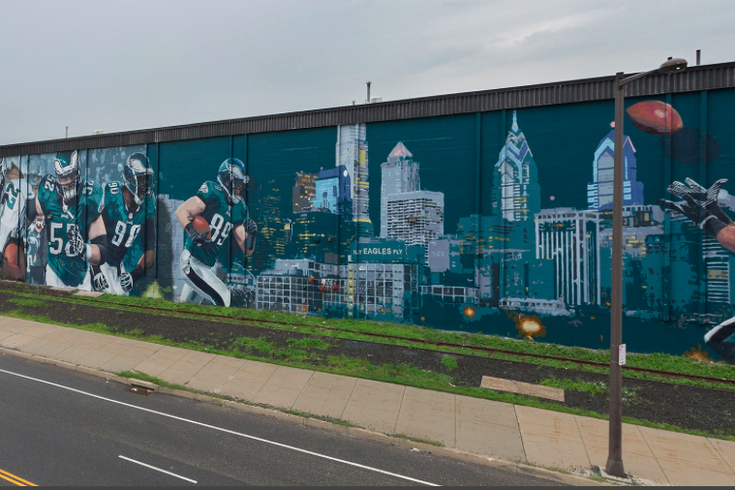 Eagles mural located on Darien Street, directly across from Lincoln Financial Field. The countdown to the start of Eagles training camp is at one week. All of those burning questions, which we hope will not result in a dumpster fire, will start to get answered as the team’s overhauled roster takes shape behind Chip Kelly in his critical third year as head coach. The design, conceived by Eagles graphic designer Christine Dorn, was developed in partnership with mural artists Phillip Adams and John Laidacker. More than 1,000 people, many of them season ticket holders, collaborated to paint the 17,000 square foot mural during four community paint days in November 2014, sometimes joined by players. 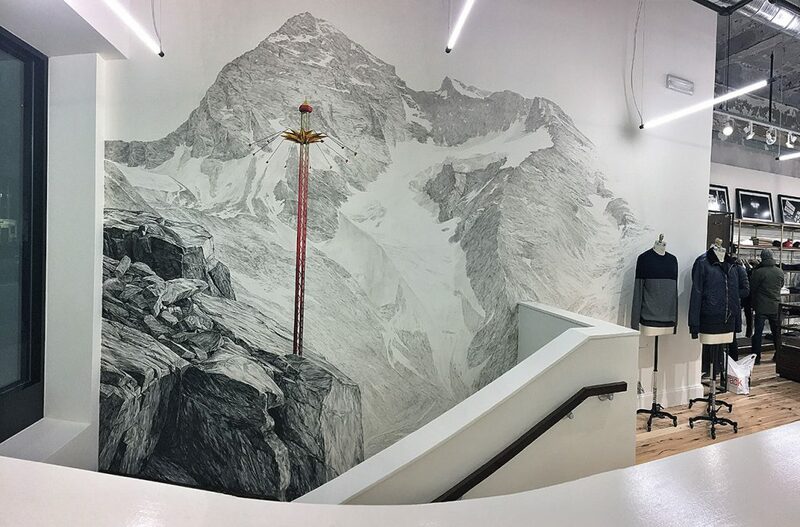 A total of 2,900 man hours and 386 gallons of paint went into the mural, which involved affixing 688 pieces of five-by-five parachute cloth the to the wall. It will be a perfect complement to the gameday experience and is another demonstration of why Eagles fans are second to none in the NFL, even when it comes to being hated. As WIP’s Glen Macnow put it on the air with Reuben Frank this weekend, it’s better to be the fans people in opposing cities hate than to be fans of a team nobody cares about. L’extraordinaire muraliste Phillip Adams est de retour à Montréal pour poursuivre son oeuvre aux Habitations Jeanne-Mance. L’immense complexe de HLM situé au coeur de Montréal, accueille sa sa septième murale à l’angle des rues Ontario et Saint-Dominique. 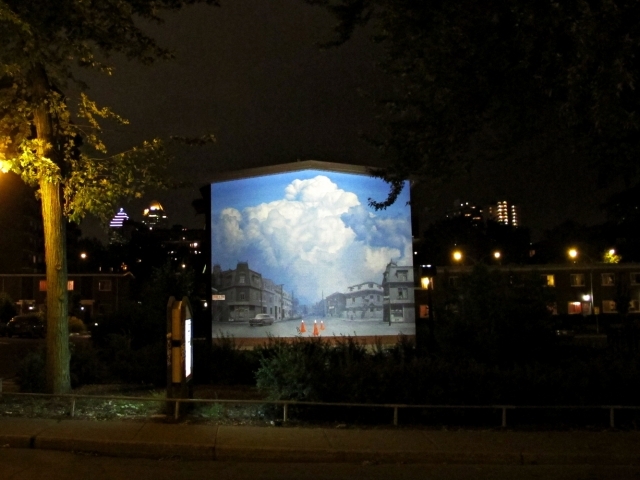 L’artiste américain, établi à Philadelphie, s’est révélé aux Montréalais en 2009 avec une première de quatre murales sur le thème des saisons, réalisées en collaboration avec David Guinn. Ces quatre fresques sur l’hiver, le printemps, l’été et l’automne sont visibles du boulevard Maisonneuve, entre Sanguinet et Saint-Dominique. En solo, il a exécuté L’Air du temps sur la rue Sanguinet en 2012 et Au fil de l’eau en 2013 sur Ontario. Cette fois-ci, il développe le thème de la terre. Son tableau, en trompe l’œil, mettra les arbres en vedette. Il a trouvé son panorama sur le Mont Royal près du Lac des Castors. 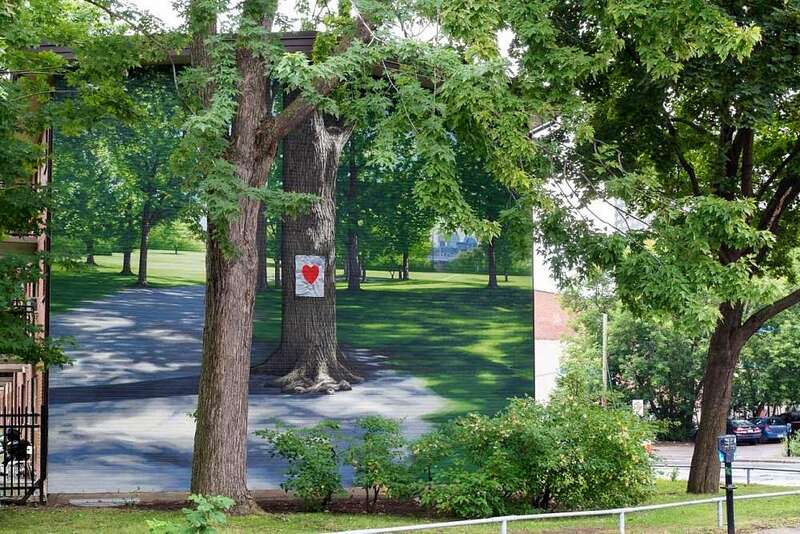 Dans son tableau, il a esquissé une percée dans la forêt qui révèlera le centre-ville de Montréal ainsi qu’on l’aperçoit de l’Avenue du Parc. Vous aurez compris que le paysage qu’il propose relève de l’invention. Phillip admet que la toile de fond a été très rapide à peindre mais il s’empresse d’ajouter que ce sont les détails qui sont longs à exécuter. Depuis le commencement de l’oeuvre le 14 juillet et jusqu’à la mi-août, date prévue de la fin de sa réalisation, l’artiste-muraliste peut compter sur l’aide de stagiaires rémunérés par l’organisme MU, initiateur de ces projets de murales aux Habitations Jeanne-Mance. MU recrute ses assistants parmi les étudiants et les finissants issus des programmes en art du cégep et de l’université. Phillip Adams qui, à 36 ans, a déjà une prolifique carrière de muraliste et d’artiste peintre, aime son statut de mentor. Pendant son séjour à Montréal, l’artiste est logé dans un appartement des Habitations Jeanne-Mance. Les œuvres de Phillip Adams ont littéralement transformé le quartier que les accueille. Elles ont amené de la beauté, du calme et même de la conscience. Chaque fois que je croise Au fil de l’eau, angle De Bullion et Ontario, je ne peux m’empêcher de penser à l’importance de cette ressource et d’aimer encore un peu plus ma ville qui trône en haut de ce paysage apaisant. L’effet que font ces fresques explique probablement la raison pour laquelle elles ne sont jamais, à ma connaissance, vandalisées. Leur auteur en est très reconnaissant d’ailleurs. ‘’Je vois ça comme une marque de respect’’ répond-il lorsque je lui demande comment il explique le fait qu’il ait été jusqu’ici à l’abri des tags. L’an prochain, Phillip Adams devrait clore son cycle sur les éléments avec une murale sur le thème du feu. Le mur qui l’accueillera n’a pas encore été déterminé. L’artiste n’était pas venu à Montréal l’an dernier, occupé qu’il était par un projet majeur à Philadelphie dont l’inauguration a lieu cette semaine et à laquelle il assistera en fin de semaine. Il s’agit d’une gigantesque murale sur la clôture entourant le stade des Eagles de la LNF (Ligue nationale de football). Après son séjour à Montréal, Phillip Adams participera au 2e Symposium des murales de Sherbrooke qui se tiendra du 21 au 23 août. Il y réalisera une oeuvre en noir et blanc plus proche de son travail d’artiste peintre. Starting the 3rd mural in my series on the Elements (Earth), commissioned by MU! Pennsylvania has a long history of distilling. 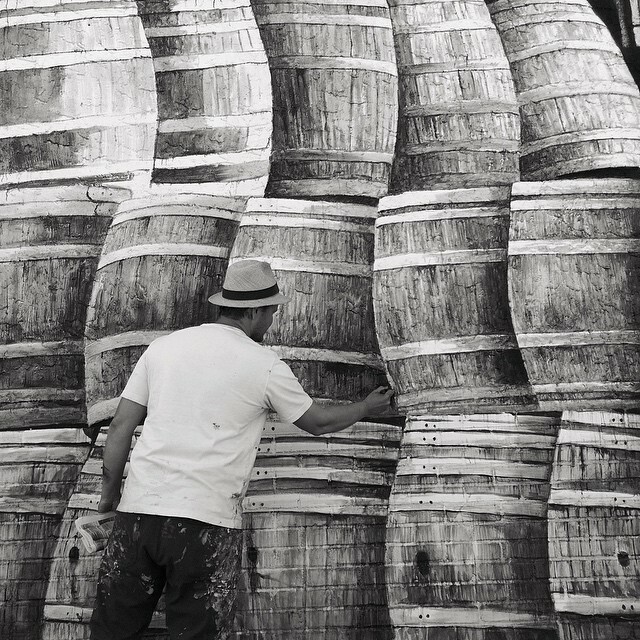 At one point, Pennsylvania had as many as 5,000 stills making spirits back in 1791. Lately, there’s been a revival of small batch distillers in our region with distillery licenses growing from 12 in 2012 to 27 in 2014. One such distillery is Rowhouse Spirits, located in Fishtown. Click HERE to see the article and read more about Dean Browne, the owner and operator of Rowhouse Spirits Distillery. Check out the amazing footage Tyson took at Ortlieb’s! There’s history everywhere in Philadelphia, if you know where to look. With his new mural series Industrious Light, artist Phillip Adams brings some of that underappreciated history to life on a grand scale. In partnership with Hidden City Philadelphia, Mural Arts and Adams are creating a visual narrative of the city’s expansive history in brewing, textiles, tool making, railroads, and other key industries. 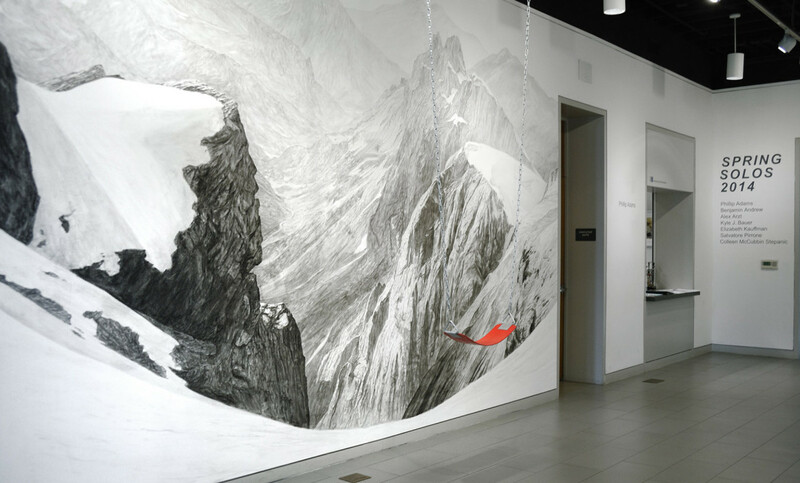 The murals stand out thanks to Adams’ distinctive style of painting directly onto walls with charcoal. 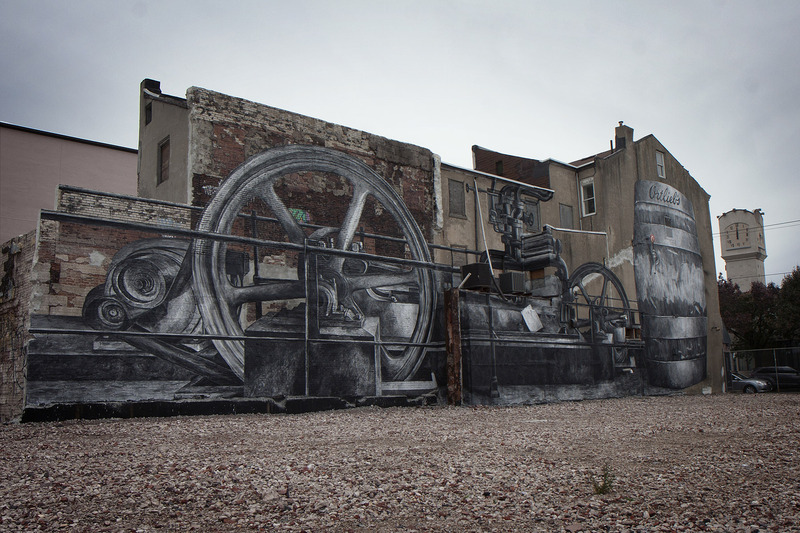 Industrious Light: Ortlieb’s Brewery © 2014 City of Philadelphia Mural Arts Program / Phillip Adams. Ortlieb’s Lounge, 847 N 3rd Street. The first mural in the series, Industrious Light: Ortlieb’s Brewery, went up in fall 2014 on the side of Ortlieb’s Lounge in Northern Liberties, next to the site where Ortlieb’s Brewery once stood. The piece celebrates Philadelphia’s long brewing tradition, incorporating machines and supplies from the original brewery into the design. Phillip Adams at work on Industrious Light: Rowhouse Spirits. 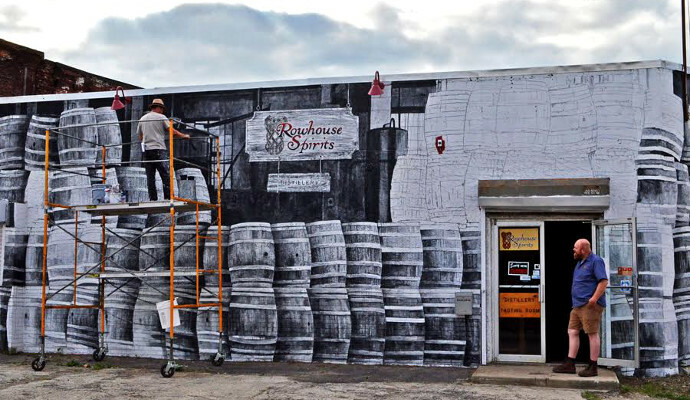 In April, Adams got started on the second Industrious Light mural at Rowhouse Spirits in East Kensington, located next door to Philadelphia Brewing Company. But not all the Industrious Light murals will be about brewing and distilling. Below is a concept drawing for a proposed mural, Industrious Light: Textile Industry. Mural Arts hopes to continue the project through next spring and perhaps beyond, highlighting additional sites and historic Philadelphia industries. Head on over to Rowhouse Spirits to see the latest piece in the Industrious Light series, and look for more Industrious Light murals and events with the Philadelphia Public History Truck, coming soon. 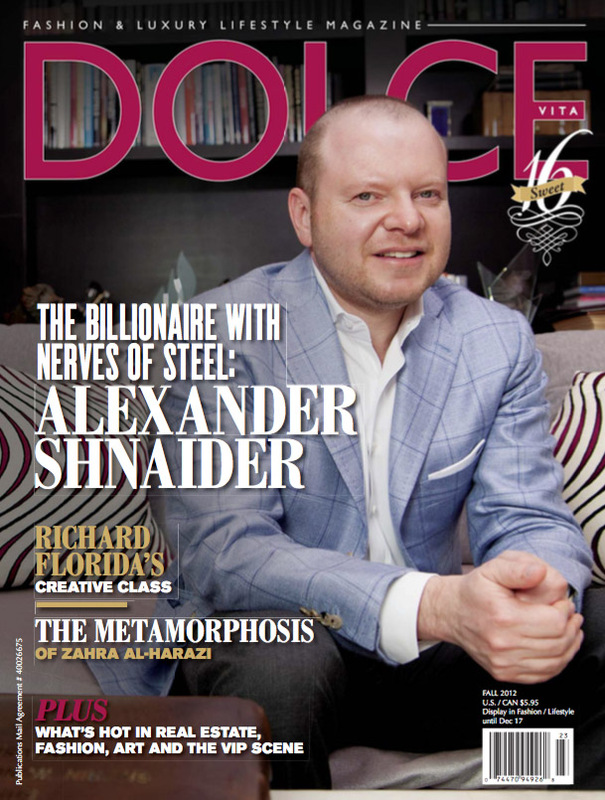 Grateful to be included in this list in Montréal! Merci! Elles sont tellement grandes qu’il faut souvent reculer pour les voir en entier, les murales apparaissent généralement lorsqu’un échafaudage hydraulique est stationné près d’un mur vide pendant une semaine. À Montréal il y a MU, Mural, Under Pressure et des dizaines d’autres raisons pour les artistes de rue de s’exprimer légalement sur ces canevas géants. En voici 9 qui sont plutôt difficile à manquer et qui font de Montréal une ville incontournable quand il est question de Street Art. Street Art Isn’t Forever. But This Google Project Is Trying To Change That. Pretty cool that Huffington Post featured one of my murals when talking about over 10,000 street art pieces being catalogued around the world. Click HERE to see the article and find it! My murals in Philadelphia and Montréal are on Google’s new Street Art Project! Great chronicling of the mural and a bit of history. by Lauren Kay, the director of communications for Community Partners, a nonprofit fiscal sponsor and philanthropic intermediary in Los Angeles. 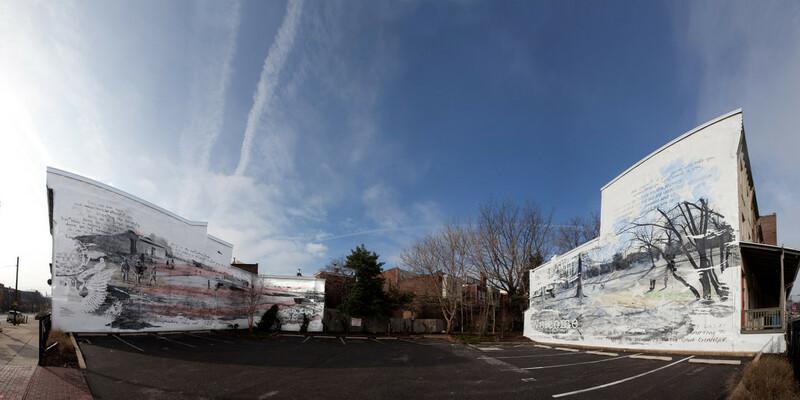 Phillip Adams – Communication Matters Mural Timelapse from Cerrone Photography on Vimeo. Outside the large hall where the keynote speakers held court, muralist Phillip Adams was easy to spot, with his paint-spattered chinos and rumpled shirt. His clothes weren’t the only thing that set him apart from the assembled crowd; he was at Communications Network #ComNet14 to paint. “This felt like a good fit,” said Adams of his commission. 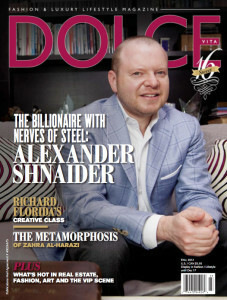 He liked the connection to others engaged in social change. For the past decade, Adams has been creating public art through the City of Philadelphia Mural Arts Program. He has a studio practice, too, but relishes how the public art projects he works on take him more deeply into issues he cares about. He has worked with nursing home residents and with post-9/11 vets which, as a self-described army brat, was particularly meaningful for him. There have been many others. Adams finds inspiration from working in the public sphere, taking cues from the physical space where his works have been commissioned, and often engaging with community residents, or a specific population, on the creative process. 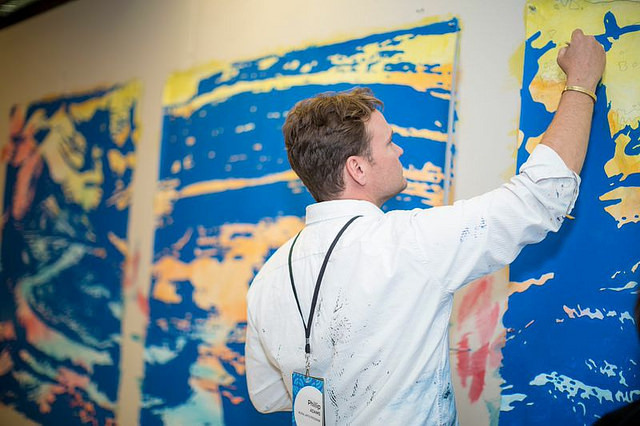 He wanted that for this project, too, and invited conference-goers, in-between their sessions on metrics and measurement and media, to put down their pens (and cell phones and tablets) and put paint to canvas. I think all of us know about looking for markers, signposts, and other guidance as we navigate through the complexities of our work. It’s what brought us to the conference in the first place, seeking the knowledge that we hope can enhance our efforts. The mural, commissioned with the generous support of Knight Arts, is now residing at the Russell Byers Charter School, where it will inspire students to create their own art. Always working to better the Philadelphia art scene, this week the City of Philadelphia Mural Arts Program will be dedicating artist Phillip Adams‘ latest piece. 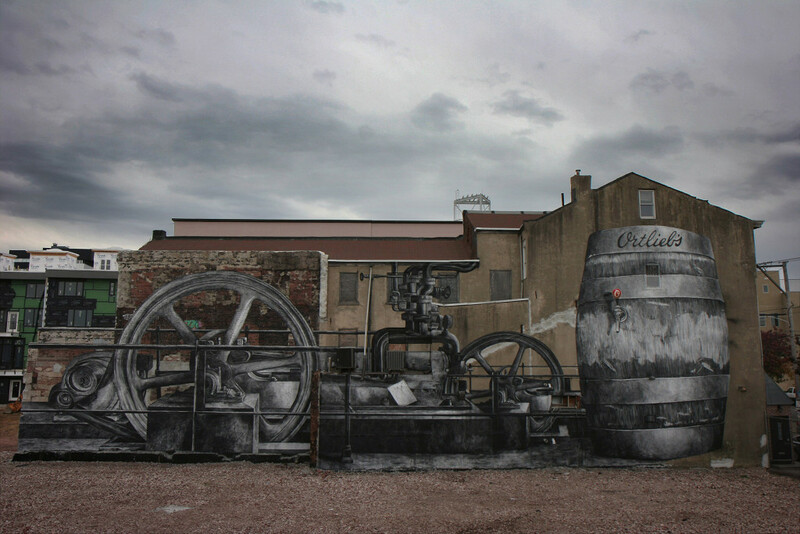 The work, entitled Industrious Light: Ortlieb’s Brewery, is the first in a series of murals by the artist celebrating the industrial brewing industry of Philadelphia. Already home to some great art, dope graffiti, and the hilarity that is Frank Reynolds, the streets of Philly just got more awesome with this new project. 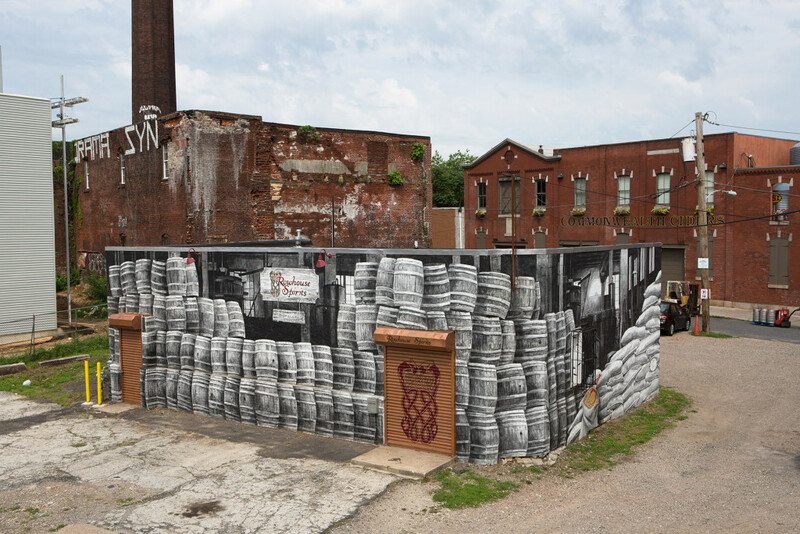 Adams’ mural series explores the historic sites where breweries once stood or still do and the long-term effects of the brewing industry on Philadelphia’s culture and architecture. The first piece overlooks the site of Ortlieb Brewery, which was demolished last year. It’s a large-scale depiction of the tools of the brewing trade. 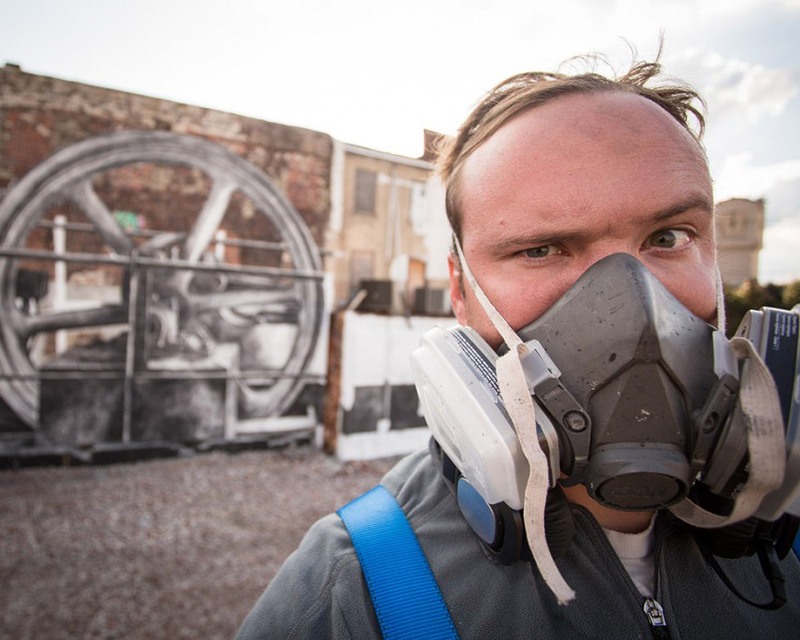 Adams plans to create his brewery-inspired murals in charcoal as an allusion to the “black and white perceptions of the past” and the “primary materials” of the booming industrial era. 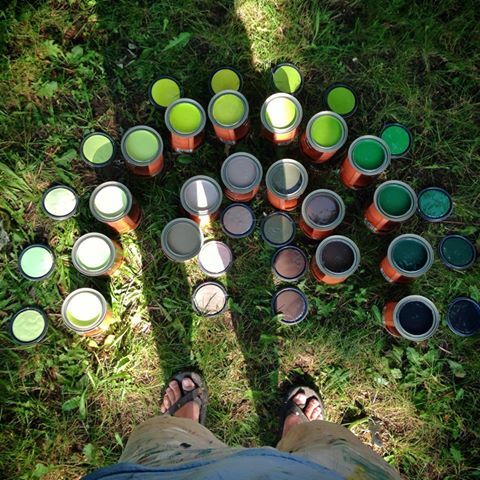 This is a time-lapse of the inaugural mural in my new series called Industrious Light. It features Ortlieb’s Brewery in Northern Liberties, Philadelphia. Enjoy! Thank you for everyone who came out! Such a great time! This is the inaugural mural in my Industrious Light, which features Ortlieb’s Brewery in Northern Liberties, Philadelphia. This mural provided an incredible opportunity to work on one of the lasting walls of the old brewery, overlooking the rubble and bones of the recently demolished building. This brewery was a cornerstone in a neighborhood that has gone through an enormous amount of change over the past decade. The wall itself was a party wall to the past, which brought a language of nostalgia and memory to a place that had helped employ a neighborhood. The wall’s aesthetic and its surroundings helped dictate the language of the mural, as the imagery used in the mural intentionally spoke to the wall’s raw and exposed history. The scale of the machinery and the barrel that I chose for the imagery related to the scale of the production that used to happen on that site, creating a sense of the building itself being a machine of production. Charcoal was used as the medium to describe the imagery in the mural. Its simplicity and elemental representativeness furthered this conversation of nostalgia and the past being in black and white, while also harkening back to a time where coal produced steam was the agent for these machines to function furthering the expansion of industry. The small moment of color on the tap of the barrel relates to our culture’s collection of the past, with the tap being one of the few relics from Ortlieb’s that may live on. At the heart of this piece lies the memory of what was there. The subtly of the medium and the scale of the drawings evoke a past that still resides in a neighborhood that has almost completely changed. With new construction, new homeowners, new businesses, a pulse of the past will always be felt even if memory fades or changes. My intention is to bring awareness to this pulse where the swells of history reside. Philadelphia artist Phillip Adams just completed the first in his “Industrious Light” series of murals that is dedicated to Philly’s history in the brewing, textile, tool-making and railroad industries. And of course he started with the most important (or at least most fun)—brewing—with a gorgeous, antique-looking mural splashed on the side of Ortlieb’s Brewery in Northern Liberties. The work at Ortlieb’s—like forthcoming works in the series—was created with charcoal to evoke a sense of yesterday. It depicts original equipment from the Brewery and overlooks the former site of the business, which is located about a block from the spot where America’s first lager beer was brewed in 1840. 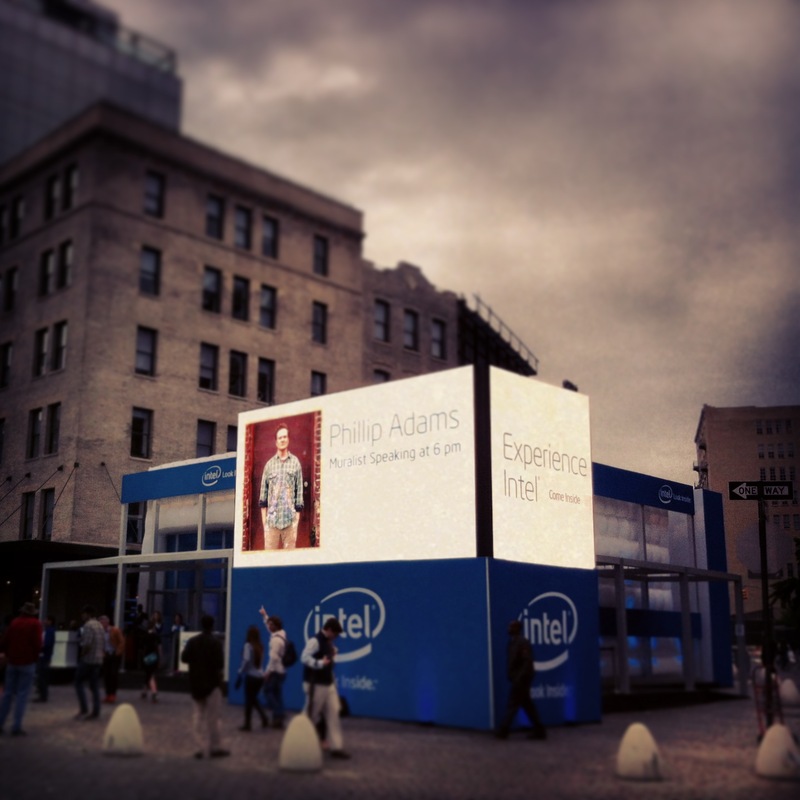 Adams is undertaking “Industrious Light” in partnership with Hidden City Philadelphia, the Philadelphia History Truck and, of course, Mural Arts. Next up in the series? Mural Arts’ RJ Rushmore tells me it will be located in East Kensington at Frankford and Hagert streets, on a building across the street from Philadelphia Brewing Company that’s being used by Rowhouse Spirits. Work will be starting on that next month. November 21st from 4:30-5 pm at 3rd and Poplar Street, with a happy hour immediately following at Ortlieb’s. At 6 pm, Air is Human will be playing. 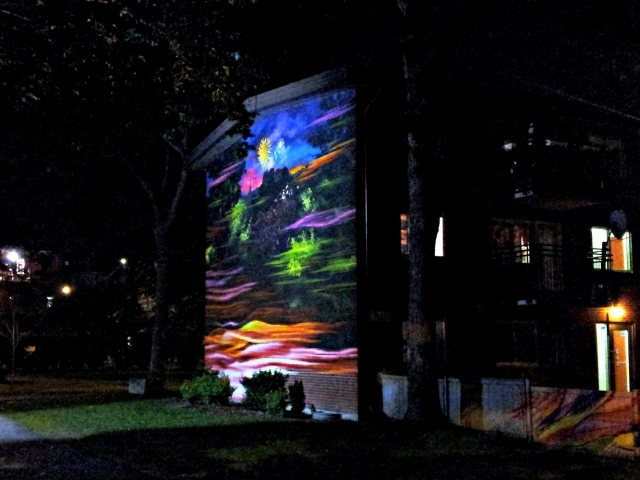 MU is very excited to announce three new murals at Habitations Jeanne-Mance are now enhanced by lighting. 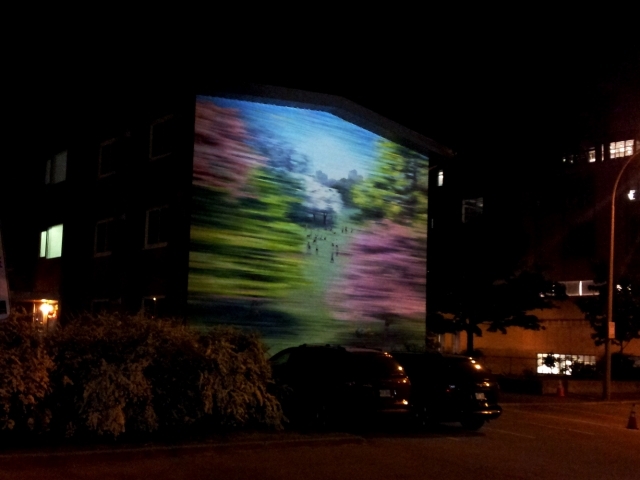 You can now admire five out of seven murals produced by MU, that I created in this housing complex after sunset. 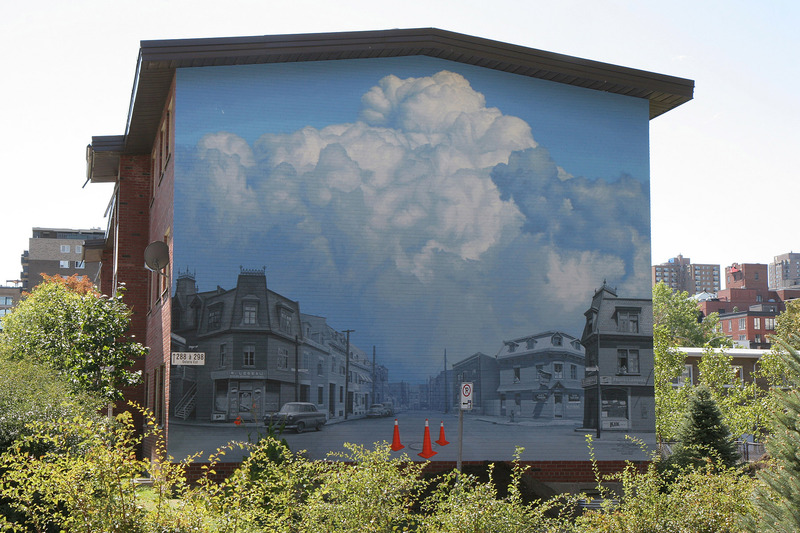 Rare are the murals in Montreal which benefit from such a special treatment. This is why MU feels really lucky to be able to offer you the opportunity to admire those wonderful pieces of art day and night. 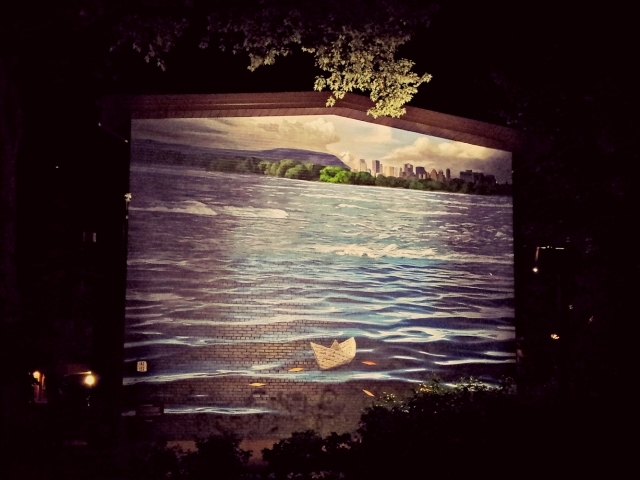 After enjoying the numerous outdoor terraces, come by Habitations Jeanne-Mance and discover or rediscover the murals in their new light, it’ll be worth your time! 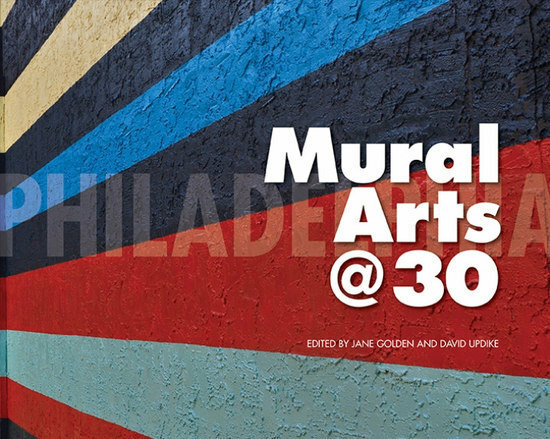 “Mural Arts @ 30” features two murals created in 2012. “Communion between a Rock and a Hard Place” was created after leading a series of workshops with post 9/11 veterans, in which their experience was expressed through writing and visual art. 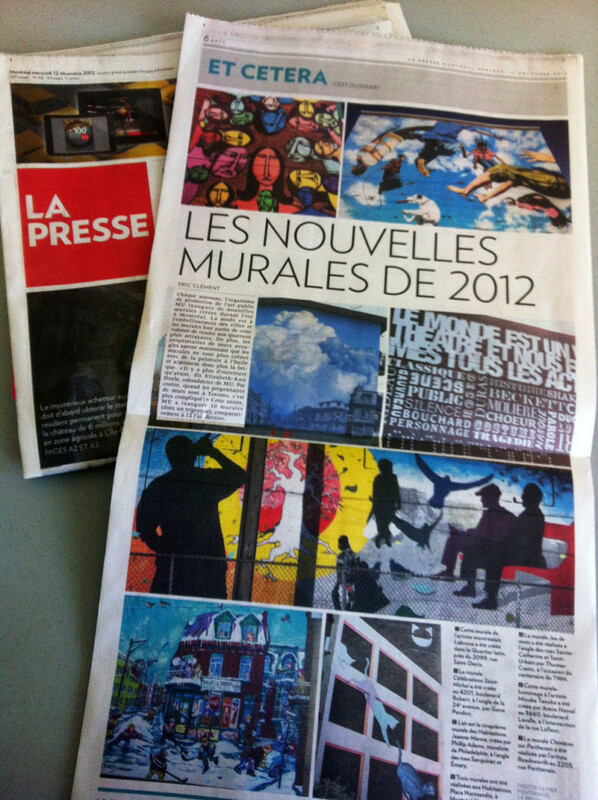 Honored to be included in the new murals of 2012 in Montréal. A few hundred paces from the Veterans Affairs Medical Center, on Woodland Avenue in West Philadelphia, the mural stretches across mirroring walls and reflects parallel worlds: wartime Baghdad and a picturesque Philadelphia homecoming. 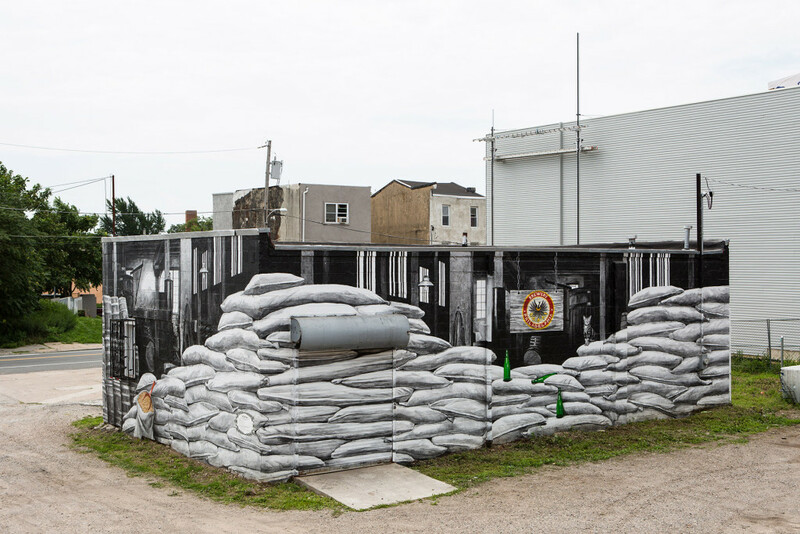 Elements of both environments are woven within the murals, juxtaposed with personal photographs, memories, and excerpts of poems penned by veterans. “There are veterans all around us coming home. 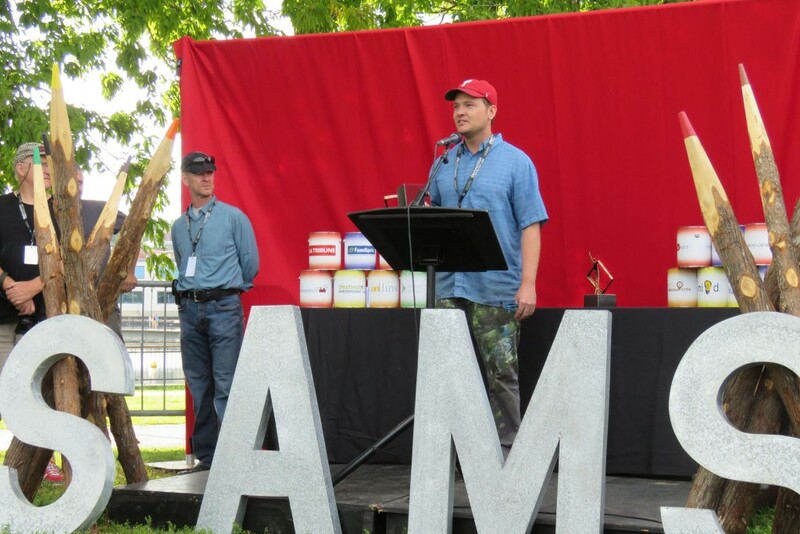 They are in our communities, whether we know it or not,” said Lovella Calica, the Founder and Executive Director of Warrior Writers, a nonprofit that uses creative outlets to support veterans. Through partnerships and word-of-mouth, it reaches a couple hundred veterans a year, most of whom served in Iraq or Afghanistan. Warrior Writers works out of public and donated spaces in a number of cities, but mostly from Calica’s West Philadelphia living room. “This is the reality of my generation,” said Calica, a 31-year-old Michigan native who is passionate about empowering veterans. “It’s so important for veterans to not have to keep their stories silent,” she said. West Philly’s newest mural is a tribute to returning vets and a depiction of their journey from the war zone to a life back home. Flanking a parking lot near 42nd and Woodland, the mural also contains verse from members of the Warrior Writers group, a non-profit that helps veterans convey their experiences through artistic expression. Phillip Adams and Willis Humphrey designed and installed the mural, which is entitled “Communion Between a Rock and a Hard Place.” One side of the two-mural installation depicts soldiers on duty. 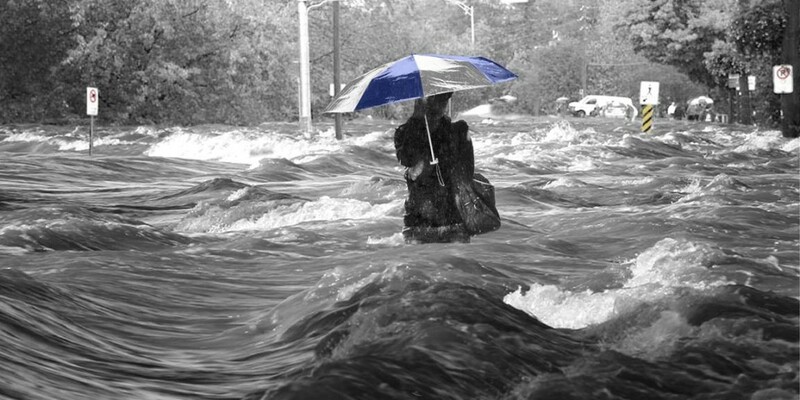 The other includes a scene of Clark Park. Together they represent the two worlds that many returning vets are trying to reconcile. The mural was financed in part through state and local grants and the city’s Mural Arts Program. Organizers hope the mural will help people better understand the transition to civilian life that many vets are experiencing. Read more about the mural here. 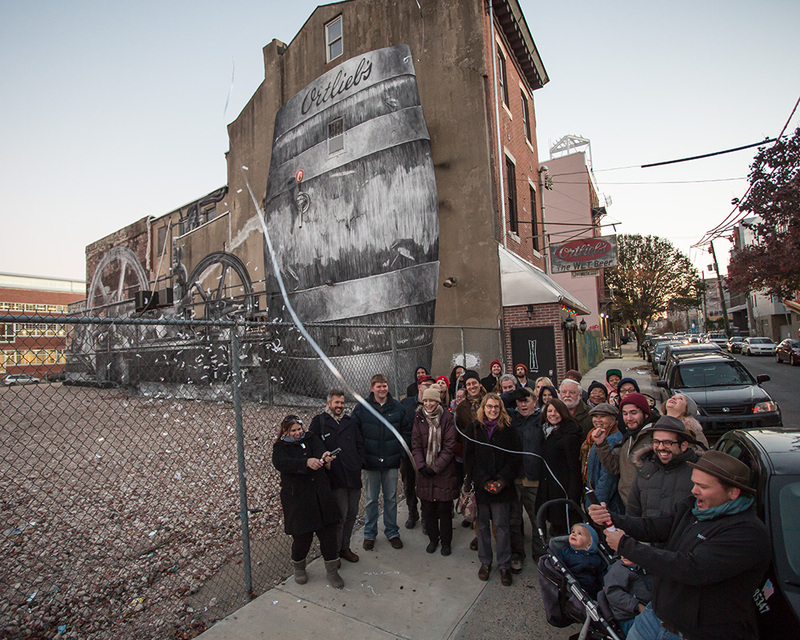 A video made by the University of the Sciences who supported and partnered with The City of Philadelphia Mural Arts Program and Warrior Writers to dedicate a new mural “Communion between a rock and a hard place” on Nov. 12, 2012. The mural was the result of the “Our City, Our Vets” program created to bring veterans, many of whom struggle in silence, into a conversation with fellow community members to share their stories and build a better network for troops returning home. Designed by Phillip Adams and Willis Humphrey, the mural is actually two facing murals depicting a scene from Clark Park in Philadelphia and Iraq and Afghanistan. The site, situated on Woodland Ave. among USciences and community buildings, was selected because of its proximity to the VA hospital and multiple universities, and the unique physical layout of the site. 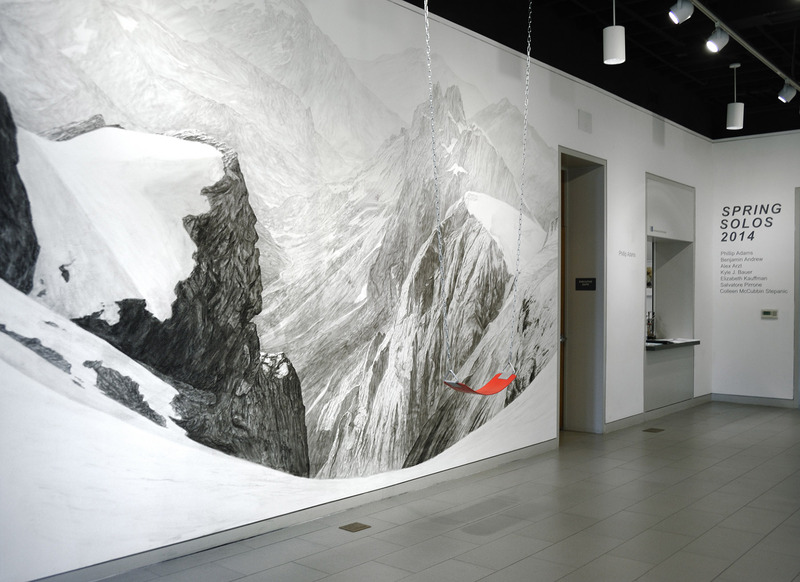 The design incorporates photographs and writing accumulated during the workshops, and mimics the technique of photographic transfers for the overall aesthetic. It is meant to give the viewer the sense of being between two worlds, worlds that are separate, but apart. Veterans can never fully leave either of these two worlds. Funding was provided by the Department of Behavioral Health and Intellectual disAbility Services and the Pennsylvania Department of Community & Economic Development. Radio Canada did a special on the murals and public art that is transforming Habitations Jeanne-Mance.